Are we the only ones who are wondering why everyone suddenly loves this building? Where were the études before someone suggested they make the building, like, useable. I understand the argument about the "turning point in Modernism", but I am left with an unshakeable feeling that this is the same kind of reactionary preservationist talk that's resisting tearing down a mundane 1920's parking garage on West Charles Street. The earlier versions of this project left us uninspired. 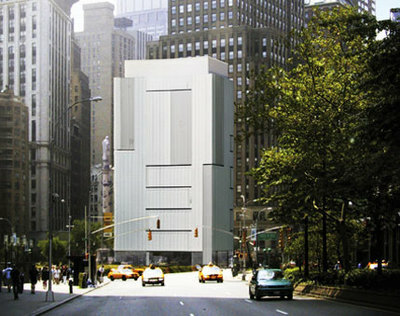 However, the rendering above gives us hope that the building will be a better object at the intersection of Broadway, West 59th Street, and Central Park West than the lollipop building is. And Mr. Cloepfil appears to be taking more design risks as the project moves forward, a startling contrast to WTC, which is becoming more safe and annoyingly boring as the project continues. Curbed is all over this story.